MOORHEAD, Minn. – The shutout streak is over but the winning streak continues as the Gustavus women’s hockey team completed the series sweep over Concordia Saturday afternoon with a 4-1 victory. The lone goal allowed ended a streak of four consecutive shutouts for the No. 6-ranked Gusties, but they were able to score four goals in the second period to improve to 17-2-4 overall and 11-2-3 in the MIAC. After a scoreless first period, Kaitlyn Klein (Sr., Plymouth, Minn.) lit the lamp 2:26 into the middle frame unassisted. The Cobbers responded at the 7:41 mark, but the Gusties came right back with a shorthanded goal 30 seconds later off the stick of Erica Power (Sr., Lakeville, Minn.), assisted by Diana Draayer (Sr., Deephaven, Minn.). At the 12:40 mark, Klein took advantage of a power play by recording her team-leading 21st goal of the season with the help of Power. And with 5:15 remaining in the period, Power scored her second of the game and 10th of season, assisted by Klein, who both finished with three-point games, and Sydney Henrichs (Fy., Eden Prairie, Minn.). The Gusties outshot the Cobbers 40-17 as Amanda DiNella (Jr., Oakbrook Terrace, Ill.) made 16 saves. 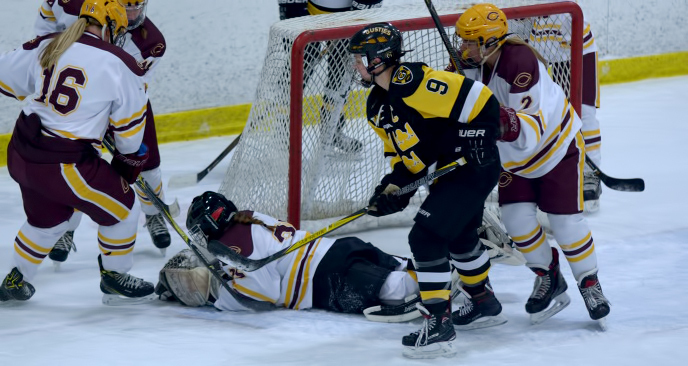 Gustavus capitalized on its lone power play of the game and killed off three Cobber power plays. The Black and Gold also controlled the dots, winning 41-of-60 faceoffs. The Gusties wrap up the regular season next weekend against Saint Benedict. Friday’s game in St. Cloud begins at 7:30 p.m. and Saturday’s game in St. Peter starts at 2 p.m.